Happy Friday! First off, thank you to everyone who read, checked out and commented on my last blog post :) I was so obsessed with that dress that I am convinced to go back and get it in dark orange too! I forgot to mention that the dress was $14.95 at H&M! Amazing. This outfit was from day 2 in Vegas. It was still hot out like if it was summer! 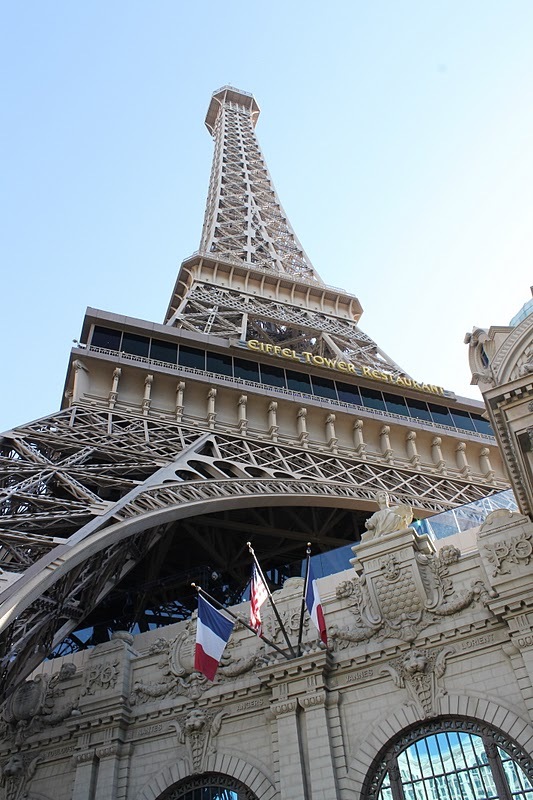 We stayed at Planet Hollywood and walked over to the neighboring Paris Casino for a lovely breakfast at Mon Ami Gabi. I've never been to Paris, so I had to get a little Paris fix with french toast and crepes. My sister and I inadvertenly matched! Cute outfit, I like everything about it. Que guapa y que preciosas fotos, me encantan tus pendientes, donde puedo encontrar unos así!!!! se ve que lo han pasado genial! So beautiful, love your outfits!Vegas is so much fun! Love this outfit and your danglers are to die for. Aww, mother-daughter stripes :) Cute, Pau! I like the accidentqlamatch between you and your siter! You both look great! darling thank you so much for your sweet comment on my blog. wait for you to follow via gfc and bloglovin I follow back where you ask me to! El vestido es muy bonito! Muy chic! Gracias por pasarte por mi blog y comentarme! Me gusta tu blog y te sigo:) Un beso. Great pics. Love your look! Qué genial el viaje, me encantaría ir!! Cute outfit chica! Vegas is so fun! I need to make a vegas trip soon! !